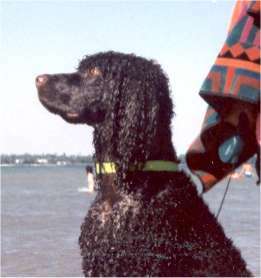 The Irish Water Spaniel has a tendency to become a one-person dog that can be somewhat stubborn. They should be well trained and socialized as puppies, and do better as family dogs when raised with the family. This water spaniel loves the outdoors and all the exercise that it can get. A great swimmer. Is good with children as long as they respect the dog’s space. Better suited for rural life with fields or fenced yard. Can be a drooler. Needs lots of attention paid to its coat to prevent matting. Read PGAA’s Hypoallergenic Dogs article. Curly and dense. No dandriff, little shedding. Considerable Could be OK for allergy sufferers. Love to swim, and need lots of exercise. Quiet.